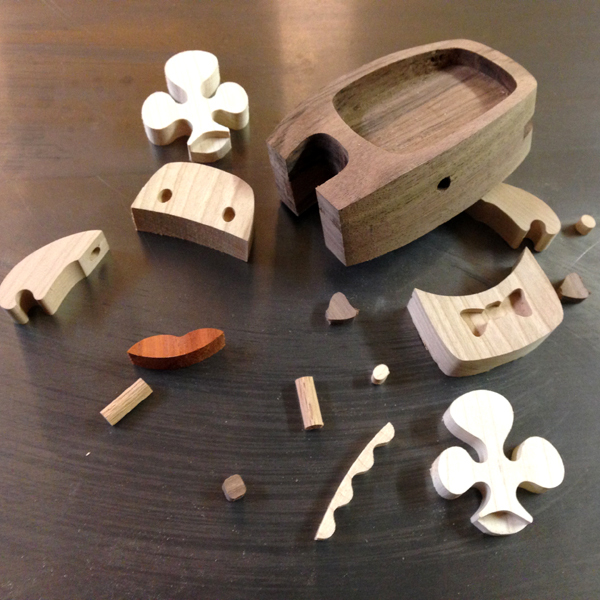 Below is a shot of all of the pieces used to make the figure. There are 17 individually cut pieces in total. You might only count 16 here but as I mentioned a few days ago - the body is comprised of 2 pieces laminated together with matching grain patterns. The body, eyes and bow tie are Walnut, the antlers, and teeth are Maple, the face and arms are Cherry, the dowel rods are Oak and the tongue is Padauk. More tomorrow!